“Gracepoint,” the 10-episode American remake of British crime drama “Broadchurch,” premiered Thursday night on Fox. When the body of 12-year-old Daniel Solano is found on a Gracepoint beach early one morning, it is clear that “America’s last hometown” is about to be rattled by the vicious crime. Especially after a crime scene investigator determines that Danny’s death was no accident. He did not fall or jump from the cliff as first thought, but someone staged the scene to look that way. This is now officially a suspected homicide. “Trust no one and suspect everyone,” is quite obviously the central theme of the show. When the detectives working the case visit the Solano household to break the news, one (Detective Carver) instructs the other (Detective Miller) to watch for unusual behavior, implying that someone in Danny’s own family could be involved in his murder. Anna Gunn as Detective Ellie Miller, Gracepoint resident and friend of the Solano family. Ellie has just returned to work after two weeks’ vacation, and she is quite happy to be back, because believes a promotion is waiting for her. However, her excitement soon turns to disappointment and anger, as the captain tells her the department has hired someone else for the position. She is crying in the bathroom on the phone when she receives word that a body has been found on the beach. Ellie’s son, Tom, is Danny’s best friend. Danny Solano (Nikolas Filipovic), is a 12-year-old Gracepoint boy who was found dead on the beach one Friday morning. Okay, so maybe he’s not a suspect, but he is still a major character to the plotline. He is part of a wildlife group in town and is best friends with Tom Miller. A medical examiner determined that his cause of death was blunt force trauma – one blow to the head – and that he died between 10 p.m. Thursday and 4 a.m. Friday. His parents assumed he had gone off to track the wildlife before heading to school the night/morning he was killed. Beth Solano, Danny’s mother, played by Virginia Kull. Upon hearing that the body on the beach is in fact Danny, she breaks into the most fake-looking cry I have ever seen. She doesn’t seem to buy that Mark was at work the night Danny was killed. Mark Solano, is a local plumber and Danny’s father (Michael Pena). Mark was supposedly out on an emergency call the night Danny died, and didn’t return home until 3 a.m.
Jack Reinhold, the town wildlife recorder who works with the kid volunteers. Carver and Miller question him the day Danny’s body is found. He says that Danny didn’t show up that morning, but that it wasn’t unusual for kids to skip shifts. To me, Reinhold sort of personifies the essence of the small, simple, coastal American town. He also reminds me of the Gorton’s fisherman. Tom Miller, Ellie’s son and Danny’s best friend, portrayed by Jack Irvine. When Ellie “breaks the news” to her son that his best friend has died, he at first reacts like any 12-year-old would. He is confused, and he looks genuinely sad. But then he asks if the police will want to speak with him, which struck me as odd. He asks his mother to be alone, and the second she is out the door, my misgivings were confirmed, as Tom whips out his phone and deletes all messages with Danny. Then, he wipes out his entire computer hard drive. Chloe Solano, Danny’s older sister, portrayed by Madalyn Horcher. She lays Danny’s stuffed monkey at the beach after learning of his death. Kendrick Sampson plays Dean Iverson, Chloe’s boyfriend, seen with her at the beach. Owen Burke, portrayed by Kevin Zegers, is Ellie’s nephew and a reporter for the Gracepoint Journal. He sees Chloe leaving Danny’s toy behind at the beach, and takes it upon himself to identify Danny as the victim on the Internet. Ellie refuses to confirm the news, but Owen posts it anyway, angering the Solano family and the police department. Renee Clemons (Jessica Lucas), is a reporter at the San Francisco Globe who sees Owen’s post and picks up the story. Her editor insists it’s not worth reporting on, but Clemons says she has a unique angle: she worked as a reporter in Rosemont when Carver was a cop there, and “can’t believe he got hired somewhere else.” Renee travels to Gracepoint and visits the beach, where she takes Danny’s stuffed monkey. Carver is visibly shaken by her presence when she arrives at a press briefing held by police later in the day. Other minor characters who may not be so minor in the future include: Joe Miller (Josh Hamilton), Ellie’s husband and Tom’s father; Susan Wright (Jacki Weaver), a somewhat sketchy-looking woman who is seen smoking a cigarette near the crime scene; Paul Coates (Kevin Rankin), a priest at a local church; Vince Novik (Stephen Louis Grush), Mark’s plumbing apprentice; Hugo Garcia (Darcy Laurie), the CSI investigator working Danny’s case; and Gemma Fisher (Sarah-Jane Potts), the owner of the local Crestview Inn. Toward the end of the episode, Miller is reviewing surveillance footage from the night Danny died, and notices him skateboarding down the street in the middle of the night. Danny wasn’t abducted – he snuck out. But no one knows where he went, or what happened to his skateboard. His cell phone is also missing. Am I honestly supposed to believe it’s normal for two loving parents to wake up to find their 12-year-old is gone and they just assume he is out tracking sea life before school? The creators of this show were definitely going for creepy, and it worked. The combination of slow-motion shots and eerie background music had me feeling some sort of way. 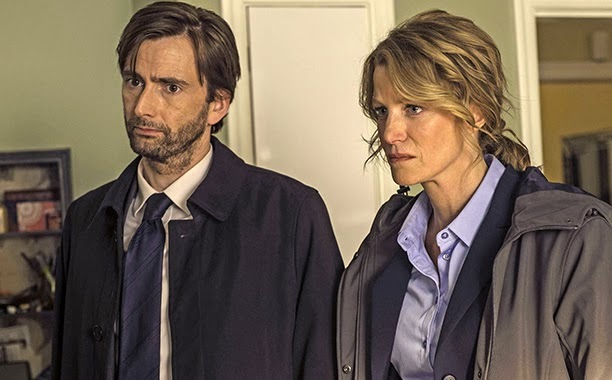 I’ve never seen “Broadchurch.” I can’t argue with those who say there was no need for a remake or that “Gracepoint” will just be a cheap American knock-off of a truly great series. But I think this show has a lot of potential, especially artistically. I like that this will be a “10-episode event.” I would hate to see a solid storyline ruined by unbelievable twists and turns because the network has too many weeks to fill (I’m looking at you, “24”). Prediction #1: Danny was killed by being hit over the head with his own skateboard. It is now missing because the killer disposed of the murder weapon. Prediction #2: Mark is having an affair. 3 a.m. plumbing emergency? I’m dubious. Prediction #3: Tom is definitely NOT the murderer. I’ve watched enough (too much) TV in my 19 years to know that that’s just what they want us to think.